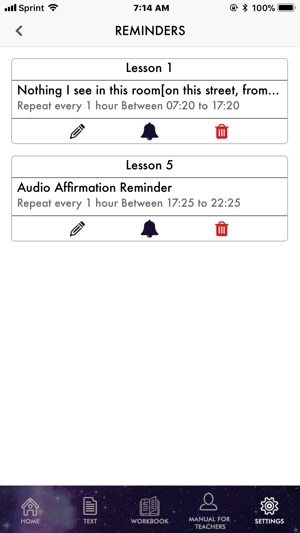 EBOOK: Read all three books of A Course in Miracles---TEXT, WORKBOOK, and MANUAL and take notes that are stored in the APP. AUDIOBOOK: Listen to the AUDIO of all three books read by Martin Caspers and accompanied by his inspired music. 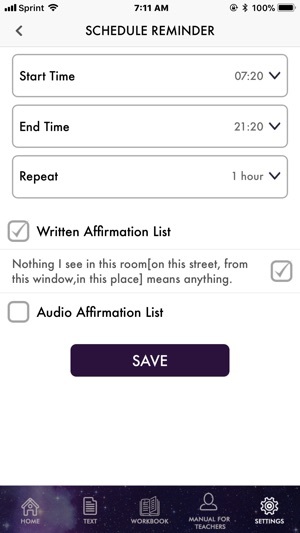 Now take A Course in Miracles with you wherever you go --- to READ and/or LISTEN to the entire book on any of your devices, as well as set a REMINDER. 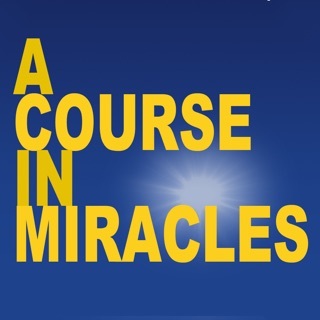 WHAT IS A COURSE IN MIRACLES – ORIGINAL EDITION? In 1965, Helen experienced what she described as a Voice which spoke clearly in her mind, saying “This is a course in miracles. Please take notes.” With Thetford’s support and assistance in transcribing her shorthand notes, Dr. Schucman took down some 1,500 typewritten pages of A Course in Miracles over a period of seven years. As she often explained, she heard a kind of inner dictation and felt compelled to write it down, even though at times she disagreed with the content and resisted the process. The voice, which spoke through Helen, clearly identified himself as Jesus. The “original edition” is the unabridged volume of the Course as it was completed by Dr. Schucman and Dr. Thetford in 1972 and before further editing had taken place. 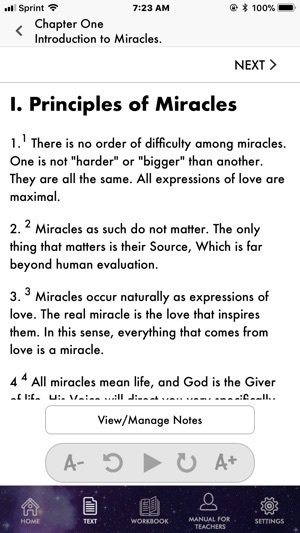 WHAT IS COURSE IN MIRACLES SOCIETY? 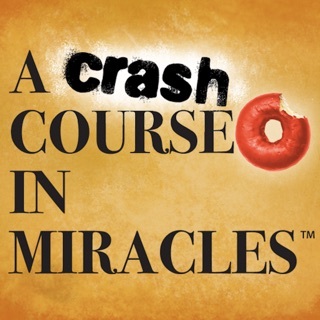 Course in Miracles Society [CIMS] is a 501 (c)(3) [non-profit] organization incorporated in 2000 which holds the copyright on A Course in Miracles Original Edition©. It is an international group of Course students and teachers organized to discover, authenticate, and propagate the Divine Teachings of A COURSE IN MIRACLES. As students, we seek to increase our knowledge of Jesus' words and to deepen our experience of His teaching. As teachers, we work to circulate the message of A COURSE IN MIRACLES throughout the world by our words, our deeds, and by the example of our lives. In the months preceding the beginning of the dictation of A Course in Miracles, Dr. Helen Schucman experienced a series of vivid waking and sleeping dreams. In three of those dreams, she was presented with a book. It was thick and black and had large gold letters on the cover. In one of those dreams, she saw it draped in a strand of pearls. That image is reproduced in the artwork for this edition in homage to Dr. Schucman’s perseverance and dedication to the completion of the Course. There is an ancient symbolism to pearls. From the earliest of times, pearls have been considered miraculous. Unique in all the world of nature, their beauty comes from the most mundane of substances and yet, it is somehow transformed by a living organism into one of the most beautiful objects known to man. And it is the way pearls “play” with light that gives them their fascinating beauty and their almost mythical status. Pearls have become, in other words, an archetypal image of what can happen to the human mind that dedicates itself to perfection, utilizing the hard knocks of daily living as a stimulus to growth. A string of pearls is, in other words, the perfect symbol for ~”A Course in Miracles. Landscape formatting for iPad is added and blank pages resolved. 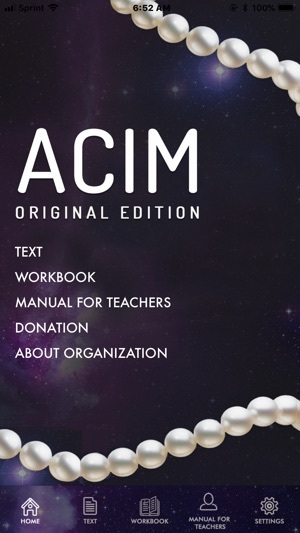 I have this version of the book at home and I am so excited to see it as an app. It’s great to have all the books together at my fingertips. I also have the Urantia book app which is nicely put together with some additional features I find super helpful. One, is the option to have just text on the screen when reading. The other is to easily bookmark a page by tapping the top of the screen. Finally there is a random quote function which I use all the time whenever I just need a pick me up. Thanks again for everyone who put this together. Many blessings. 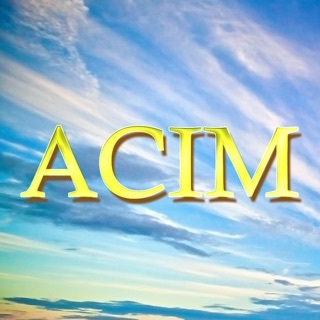 If there was any book in the world I would need a bookmark for, it would be ACIM. Having a book app like this without bookmark capability is.... unique. Also window for text is too small. 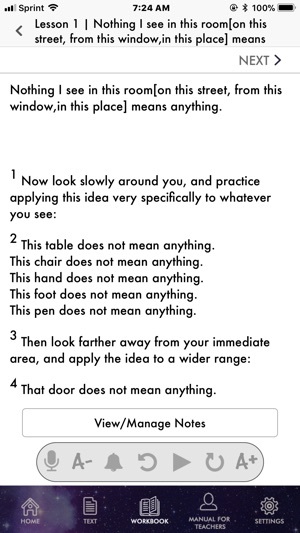 Would like to maximize window to full screen for reading on phone. Since 1981, in reading groups and in private. I gave this app 1 star due to not keeping the reading spot after closing the app. Is an update planned to fix this ?